Sick of using potatoes as side dishes for your dinner meal? Left in their uncooked form, raw potatoes have a variety of weirdly practical uses, from aiding you in removing a broken light bulb from its fixture to keeping your ski goggles clear in the cold weather. A raw potato can also help with your floral arrangement, add new life to your beat-up shoes, and absorb the excess salt from your overly salted soup and stews. Though potatoes are hardly pretty to look at, potatoes make for a great ingredient for your daily beauty regimen. 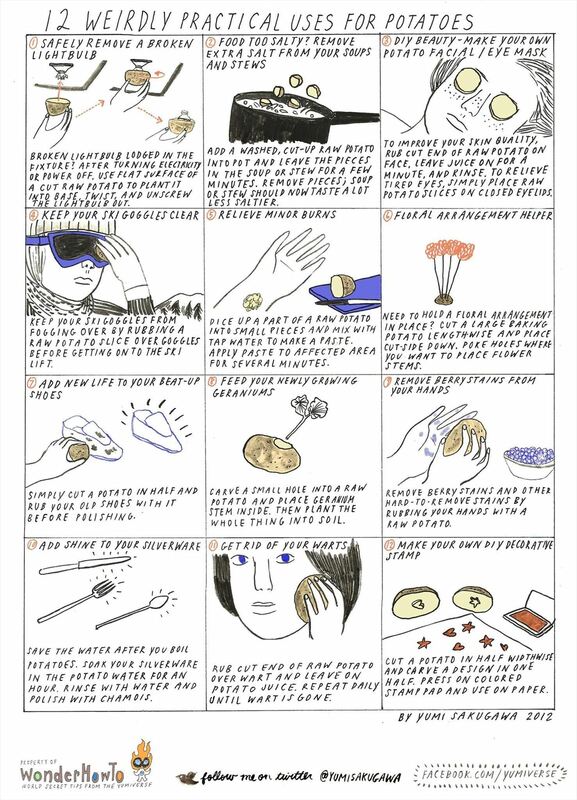 Raw potato slices are great to use as facials, DIY eye masks, and for removing warts. Got your own experiences with using potatoes in unconventional ways? Share with us by commenting below!